Shopping for clothes can really be hassle for me. I am not exactly very slim or pudgy but just a little on the heavier side or rather curvy. It’s somewhere in between. Though I could find sizes that fits me but more than often, they don’t look very flattering on me – given my broad shoulders and wide hips. Blog shops that featured slim and slender models clad in their own brand of clothes doesn’t tell us really us curvy ladies to find that perfect fit. Yes, there are online fashion stores that offers plus-sized clothes but the sizes are tad too big for us. You know what I mean? So we are pretty much left in the middle, trying to figure the type and cutting of clothes which will fit us better. I know what I should avoid and what type of dresses would flatter me. Now, things would be much easier with some help from Lurvy Curvy, a blogshop catering clothes and accessories to curvier ladies. They not only offer clothes that comes in various sizes from XS to XL but also beautiful accessories to jazz up your outfit. Also, they provide detailed information and recommendations to how to dress according to their body shape and size. So perhaps if you want to create the illusion of a smaller waist, they would identify some designs that would make you look flattering even if you don’t own that barbie-doll figure. At the end of the day, it is all about dressing smart – bring out the best in us. We curvier women may have chunky arms and broad shoulders but we’ve got a fuller chest and sexier hips. We should embrace what we’re blessed with! I got to try on a few tops by Lurvy Curvy which offers a range of styles for work, casual and party. They are expanding their collection at the current moment and I really hope to see more of their upcoming collection. Accessories can do wonders. Belt it up and you have narrower waist. They not only complete the look but they also act like tools to ‘trim’ off the ‘excess weight’ or to bring about focus to other parts of our body. I am loving this classy white belt which is highly versatile as it would be use to belt up around the waist especially when you are wearing loose tops or dresses. I love bracelets or bangles with simple designs like the one shown below. I had a very fair skin tone so it adds a nice glow to my skin. This hair accessory below, the Greek goddess headband, is my favorite by far. It is a headpiece with golden leafs chained together. It is quite intricate and looks very pretty. It can be used as headband to keep your fringe away. It adds a nice sparkly touch to my hair and this would be perfect if you are going for that Greek goddess look. I hope I could find a beautiful white dress to pair this headband with for an upcoming photoshoot. It would be awesome! So my ladies, fear not if you are curvy, be bold and dress well because every girl deserves a chance to shine. 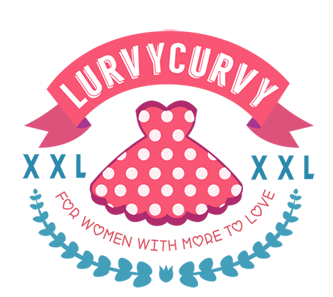 Visit Lurvy Curvy Facebook page or their website.